I never thought I would have the courage to fly in a tiny plane, I found large commercial planes scary enough. I certainly never imagined I would land on a glacier in a tiny plane. But that’s exactly what I did when I was in Alaska. I did a Denali flightseeing tour! My friend Ruth told me about her amazing Denali flightseeing experience over the mountains of Denali National Park and I knew it would be the best way for me to see the great mountain other than by climbing it. Maybe it was time to overcome my fear of flying. The small frontier town of Talkeetna Alaska is where the majority of scenic Denali flightseeing tours leave from, and I was already going to be passing through there on my way back down to Anchorage from Denali National Park. Perfect. I decided to wait until I got to Talkeetna to book it. I would leave it up to the weather gods to decide if my Alaska experiences would include a Denali Flightseeing tour. If it was wet and cloudy I wouldn’t go, but if it wasn’t – well, then I promised myself that I would do it. I arrived into a sunny Talkeetna Alaska on a morning bus from Denali National Park. After checking into the hostel, I went for a walk into town. On the way I saw Talkeetna Air Taxi and went in to enquire about Denali flightseeing. 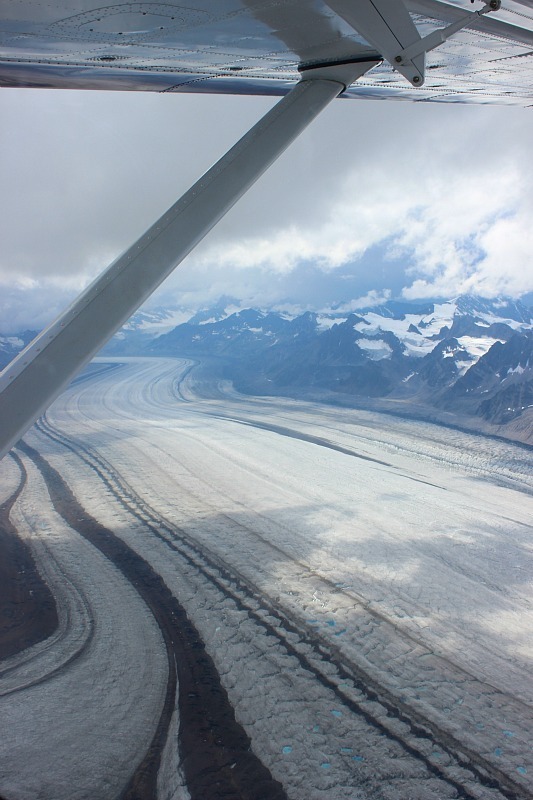 Turns out the next day was forecast to rain so before I knew what I was doing, I had booked myself on the cheapest Denali Flightseeing option with a glacier landing, that explored the south side of Denali National Park. It was departing in two hours time. Suddenly my vague plan to go Denali flightseeing was a reality. Booking it so soon was scary and a bit overwhelming but it was actually the best thing I could have done as it only gave me a short time to worry about it. If I had booked it for the next day I would have probably been up all night stressing. That’s just what I do. After a quick look around in town I was back at the Talkeetna Air Taxi office, sitting in the sun on the deck watching planes take off while I waited for my flight to board. Even dosed up on valium, I was nervous as hell. A million butterflies had taken up residence in my stomach. I was very lucky to be upgraded at the last minute to the two hour Grand Denali Tour which actually circles Denali as well as landing on the glacier. It was also in a slightly larger plane. Thanks Talkeetna Air Taxi! 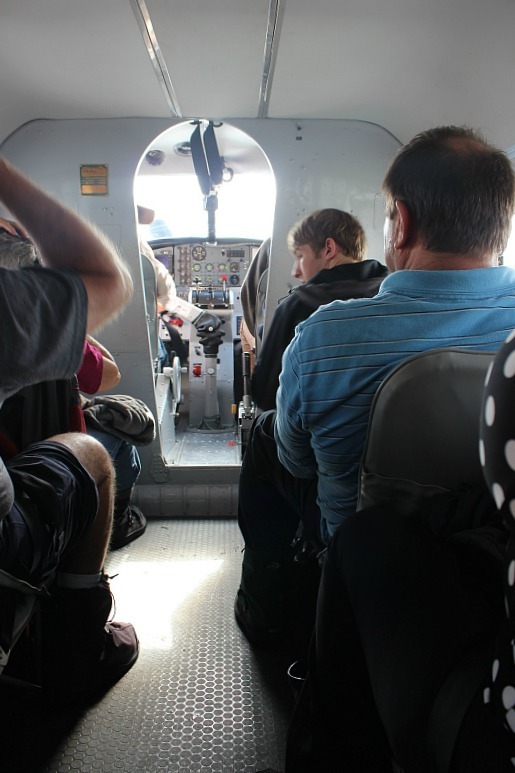 As I boarded the ten seater De Havilland Otter I felt a twinge of excitement through the cloud of fear. This would be like nothing I had ever done before. I just hoped I wouldn’t die. The take off was surprisingly smooth, much smoother than take offs in larger planes. Some of my fear eased as we flew over the windy milkiness of the Talkeetna river and headed in the direction of the mountains. Intermittent clouds swirled between our tiny plane and the vast emptiness of the snowcapped mountains and glaciers of the Alaska Range below us. The Ruth Glacier stretched into the distance, a massive highway of ice. Bright blue pools of meltwater and giant crevasses pocked the surface of the 4,000 foot thick ice behemoth. My fear dissolved as I tried to take in all of the beauty below me. Jagged peaks of ice rising up from the glacial plains. Blinding white and glowing in the sun. Impossible beauty. And then Denali was before us, the king of mountains. The tallest in North America. Untouchable and mysterious. Completely covered in snow, the lofty peak penetrated through a halo of clouds. Bumping through the turbulent sky, we circled the mountain. The Wickersham Wall of Denali – the greatest continual vertical relief in the world – appeared along one side of the mountain in all it’s icy danger. A sheer cliff of ice. Nothing could have truly prepared me for how I felt when I saw Denali up close. My eyes were glued to the window. Excitement coursed through me. I dream of mountains like this. I felt pure joy and a child-like wonder that something so grand exists in the world and that I was lucky enough to get so close to it. An experience that I will always cherish. 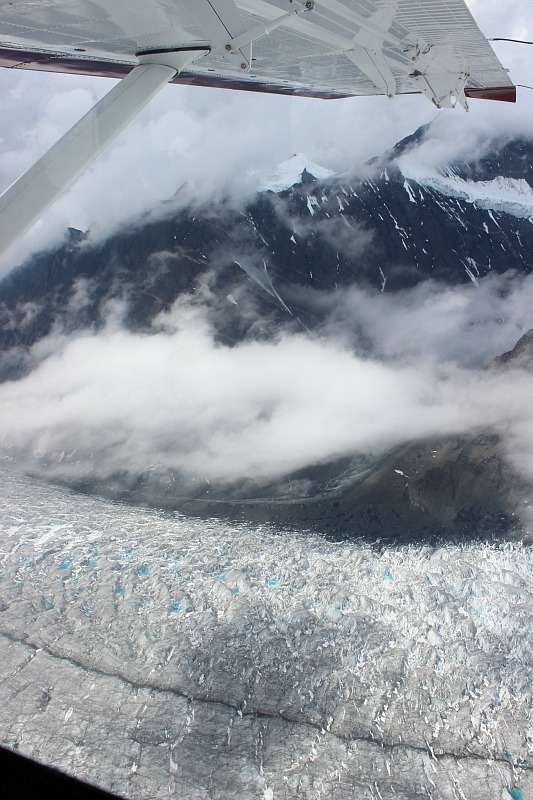 As we turned away from the mountain another grand road of ice, the Kahiltna Glacier, appeared below. Forty five miles of stark ridges of ice, going nowhere and home to no one. I never knew glaciers of this size existed outside of Antarctica. Alaska was continually surprising me with its vastness and impressive scenery and I was surprised yet again. Back along the Ruth Glacier we turned off to a smaller glacier, the Pika Glacier, where we landed. Our small plane was fitted with retractable skis and slid on the ice before coming to a perfect stop just as the rain began to fall. Dark clouds gathered above us as we descended the plane onto the glacier. We gathered under the shelter of the wing until the brief deluge had stopped. Walking out onto the Glacier felt different than I thought it would. I was expecting hard and slippery ice but the consistency was slushy, my feet sinking into the mushy ice with every step that I took. The sky was dark and moody. I could feel the wild emptiness of the place. Bleak and unforgiving. Another small plane landed near us and the silence was shattered. It was time to take off. I should have been nervous about taking off from the glacier but I simply wasn’t. My sense of wonder overtook all other senses, including fear. Back in the air, we quickly left the land of ice and snow and were back in the rich green Susitna Valley. A great gorge crisscrossed by glimmering rivers passed below. 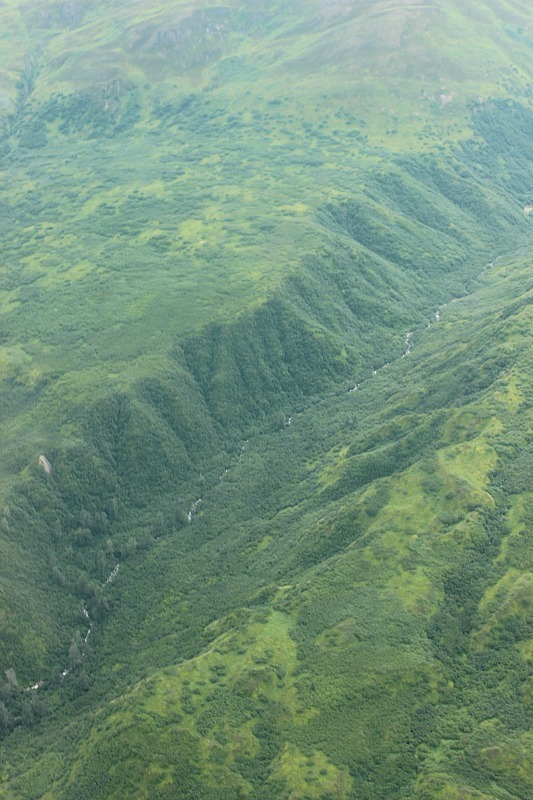 Flying close to mossy mountain peaks, we could see waterfalls tumbling into verdant valleys. 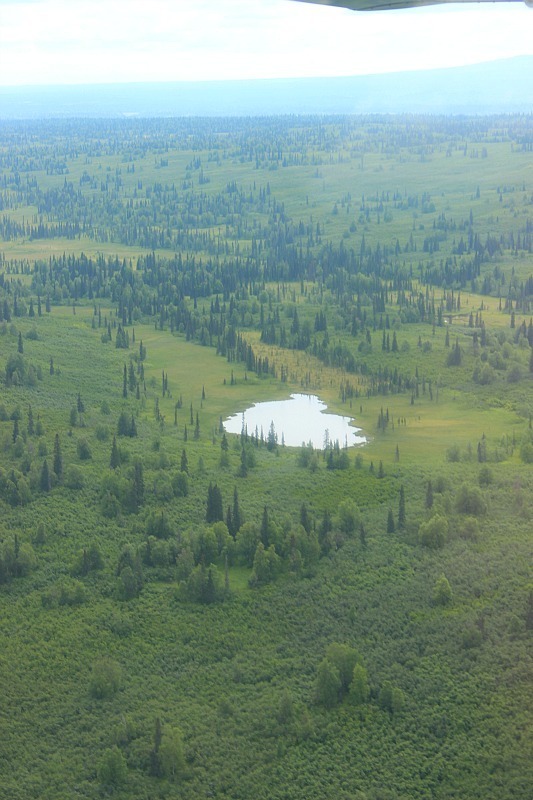 The green mountains gave way to lake dotted marshlands which were punctuated with remote cabins, completely off the grid. Landing back at the small airport I was sad it was over, the only flight I have ever felt that way about. My Denali Flightseeing experience was utterly remarkable. Disembarking the plane, I was so proud of myself that I had done something that truly scared me. And I had done it alone. The incredible wonders I had experienced on my Denali Flightseeing tour are something that I will never forget, but the sense of accomplishment that I felt was second to none. I was on top of the world despite having my feet back on the ground. Flightseeing over Denali was truly one of the greatest experiences I have ever had and I would do it over again in a second. Bumpy skies and all. Thanks to the excellent Talkeetna Air Taxi for the discount and amazing upgrade. All opinions are most definitely my own. It’s cool that you used an amazing flightseeing opportunity to see the beautiful mountains of Denali national park! From the pictures you have shown on this, I can see that it was well worth it. It’s not everyday that you get to see amazing parks and mountain ranges like this and it was done in the luxury of a plane. What a fun experience! I am also a nervous flyer, but have found that I really enjoy small planes (and most recently, helicopters) – the irrational part of me reasons that a small plane can land almost anywhere in an emergency. The tourist in me just glues my eyes on the scenery, or through my viewfinder, and focuses on the scenery! Thank you for this beautiful post. You could have been describing the flight we made with Talkeetna Air Taxi in the summer of 2013. I was petrified before we took off but once we were airborne I so in awe of the scenery I forgot to be scared. We spent almost two months traveling through Alaska by Rv in 2013 and the flight was the highlight of our trip. I too would do it again in a heartbeat!